Henry Glassie in his book, Folk Housing in Middle Virginia, U. of Tennessee, 1975, discussed the 18th c. folk (now usually called vernacular) houses of Louisa and Goochland Counties, Virginia. He recognized that their plans were based on variations of a square and analyzed the ratios he saw. 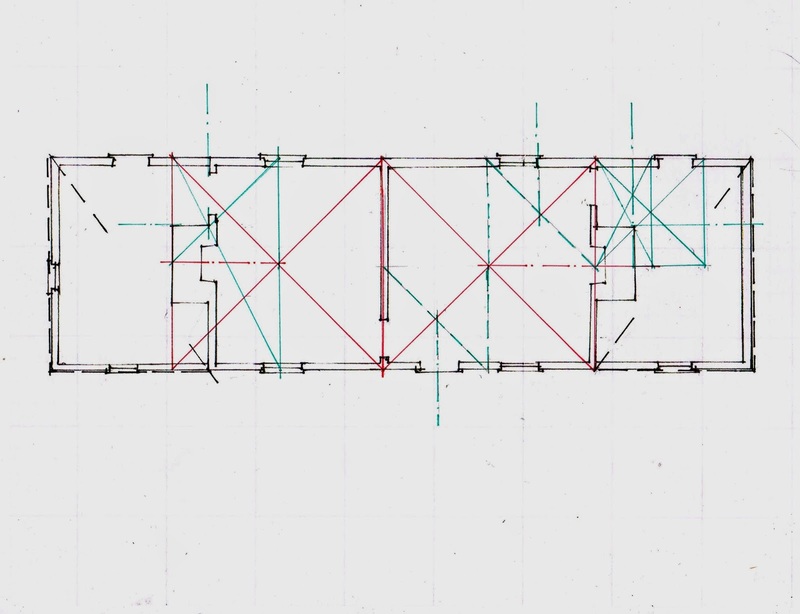 His illustrations include photographs and measured floor plans. Because I have only examined buildings in one part of the country, the Northeast, I wanted to look carefully at the vernacular houses he recorded. 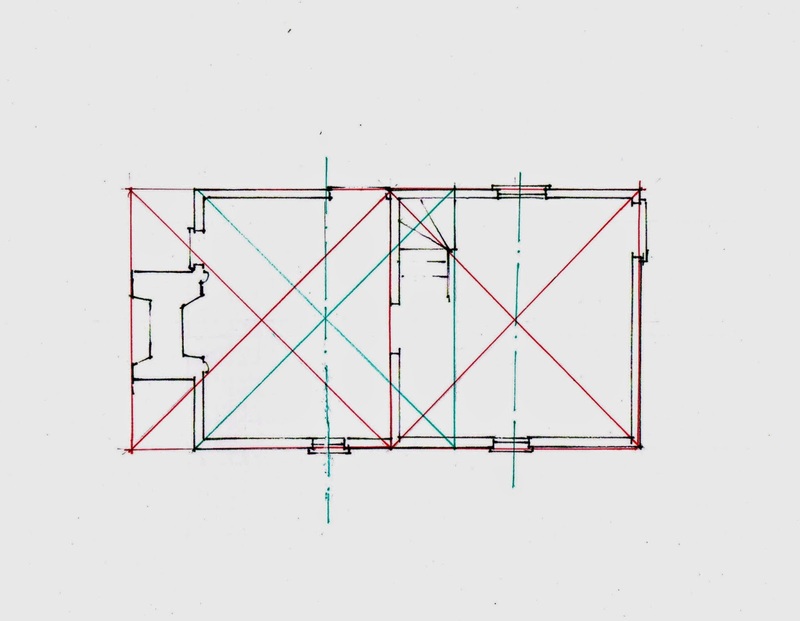 From Henry Glassie's drawings could I determine whether or not the house-wrights use geometry? If so what kind? Did settlers in Virginia bring or develop different framing geometries from those in the north? Many of these houses had back-to-back fireplaces, one in the main house, one in the adjoining shed. A chimney and fireplace in the 1700's was essential; its cooking fire never went out; it was the source of heat and light. So I include it in my analysis. Here are 3 similar geometries. 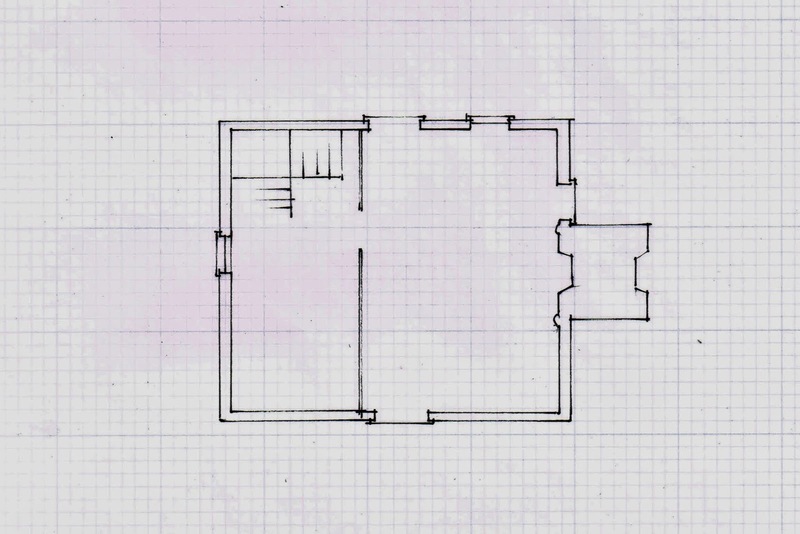 I have redrawn the plans on graph paper. Please click the diagrams to enlarge them. This is The Parrish House, Figure 35,Type 3, in Dr. Glassie's book, mid- 18th century, built of sawn logs dovetailed at the corners. Its geometry, shown below, begins with a square, drawn with two solid lines and its diagonals in red. The location of the left window. and the doors are determined by the center. The upper window is located by the half square and its diagonal - a dash-dot red line. The window and door locations are drawn with a dash-dot green line. The rest of the room, including the chimney, comes from half of the square extended on the right side, dashed red line. That rectangle, divided in half , red dash-dot lines, and its diagonals, green dash-dot lines, position the right wall and the chimney mass. I have added green arrows to show those intersections. It feels crowded on the drawing, but on site there would have been plenty of space and it is the same geometry each time, just on a smaller scale. I think the partition wall was a later addition, blocking the stair as it does. When I first drew this I thought the size was derived from the Golden Section. I kept looking for a solution based on just a square because the house is static, solid, not fluid. The Golden Section grows; it is dynamic. This house Dr. Glassie called Unique House. It is House G, Fig. 29 in the book. He notes that it originally had a chimney on both ends. The red square on the left begins with the chimney. Its right side is the partition wall between the rooms. the right room is a square of the same size. 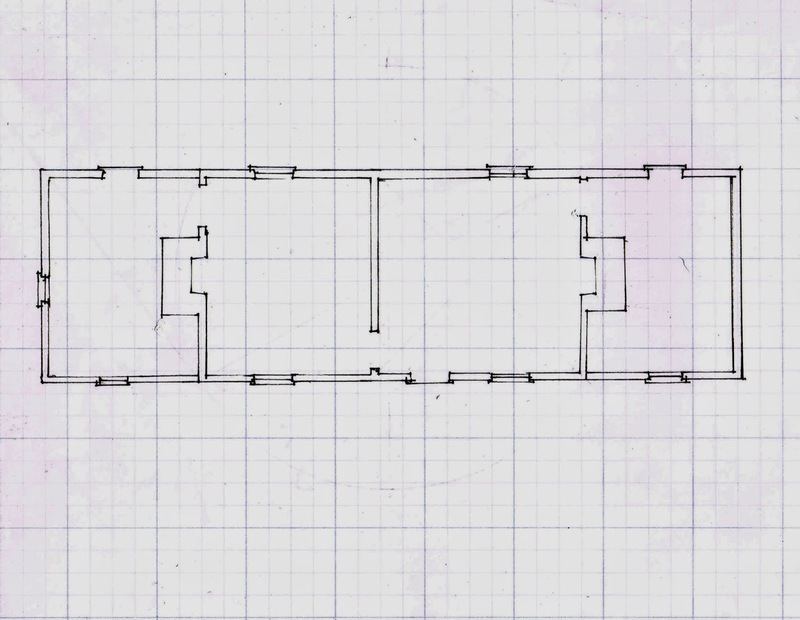 The left outside wall is determined by the square again, just as in the Parrish House above. If the square starts at the left wall, the right side is at the edge of the stair. See the green square. If the missing chimney is added to the right, the square that would begin on its outer side would also have its left side at the stair. Each side would be the mirror image of the other. The dot and dash green verticals through the centers of the squares determine the door frame and the center lines of the windows. The right green center-line is canted about a degree, not truly vertical. But the Glassie drawing indicates that the fireplace is also not centered, so I drew it in. This is The Moore House, Figure 31, Type 5, House H in Dr. Glassie's book. There is also a front elevation of this house in the book. 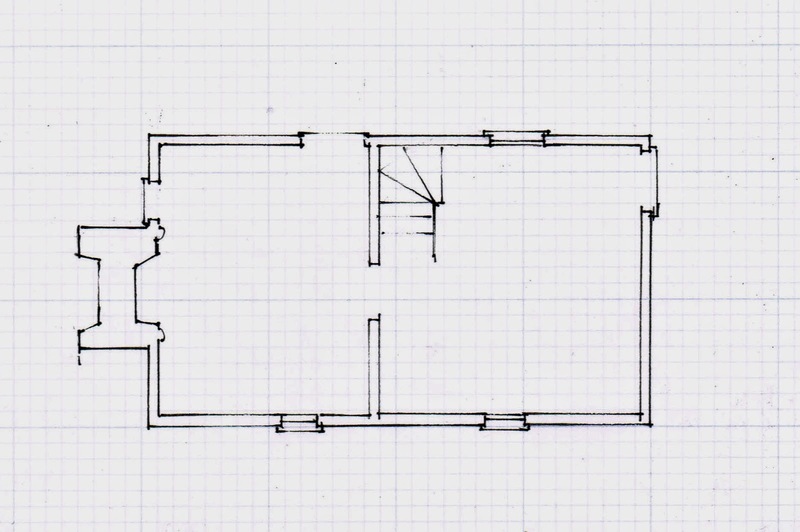 The plan shows two main rooms with a shed on each end. A turning stair is located in the back left corner of the larger right hand room. 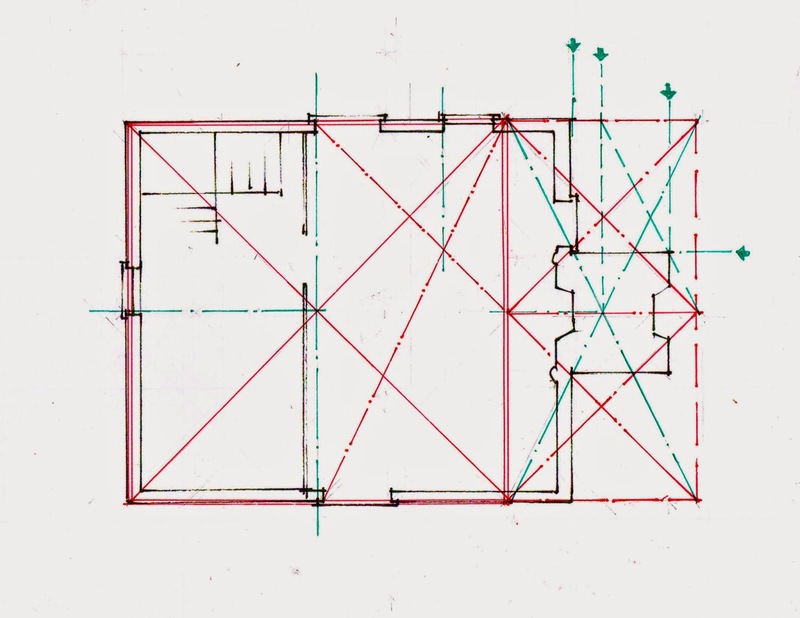 The main house is composed of 2 squares, drawn in red. The square to the left includes the chimney. Its green center line locates the center of the windows. The diagonal of half the square crossing one of the 4 small squares within the main one determines the placement of the left wall for the room. See the green dot and dash lines on the left square. The chimneys on both sides are centered on the squares. But the right chimney is outside the square. Here the smaller square's diagonal and the diagonal of its half rectangle position the chimney base. I've used a green dot and dash line here to mark the intersection as well as the window and door locations for this room. The sheds on both ends were probably added after the house was built. They are both laid out as 3-4-5 triangles insuring that they would sit parallel to the existing house. See the dashed and broken black lines on the rooms on either end. Unlike the buildings in New England and New York, the Virginia houses have only approximate dates and many of them no longer exist. 5/14/2014: I have just returned from driving back roads in Louisa and Goochland Counties, VA, looking at houses that are similar to these recorded by Dr. Glassie. The form is still visible, sometimes as a wing of a larger house, sometimes an out-building on a farm, sometimes in ruins. However, not once did I see a firebox that could have been used outside. This makes me think the houses Dr. Glassie recorded were half of an original house.